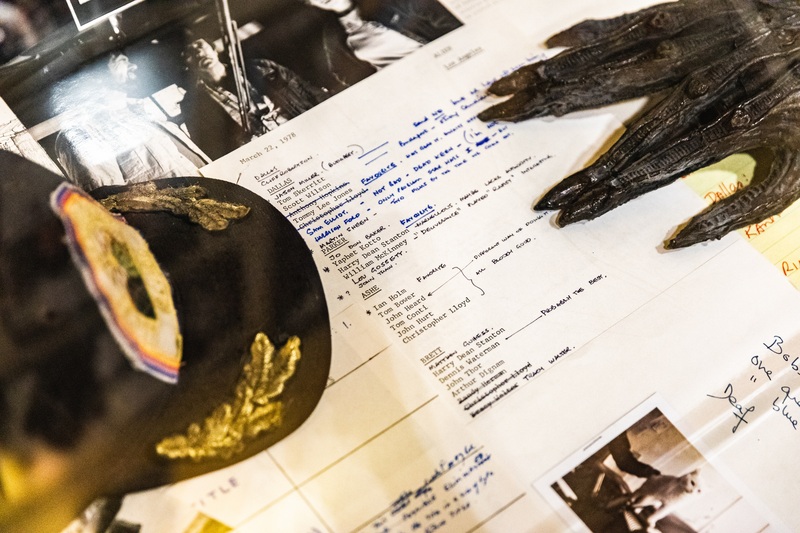 AvPGalaxy | Website | Articles | AvP Galaxy Tours USC Alien 40th-Anniversary Exhibit! 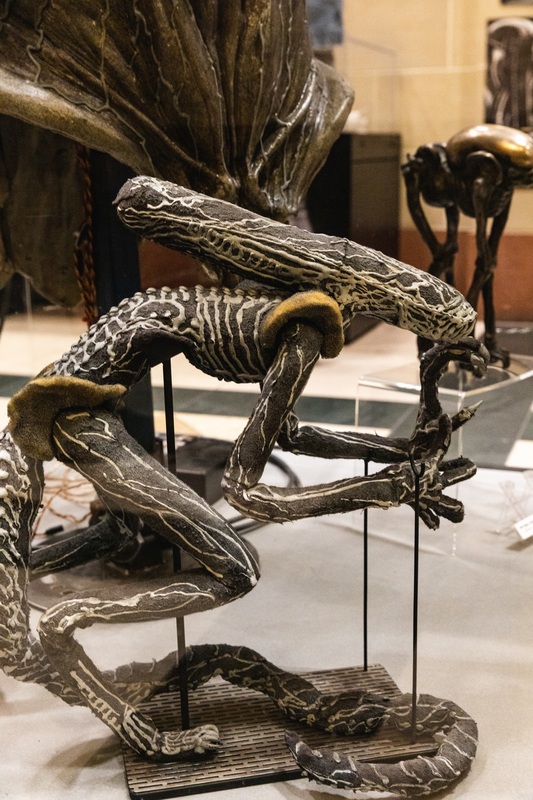 The Alien 40th Anniversary Exhibit at USC. Photo by Adam Zeller. 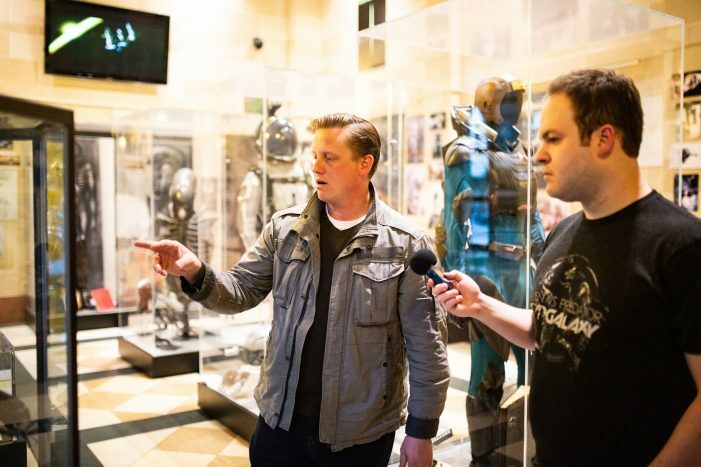 A couple weeks back AvP Galaxy had the fantastic opportunity to tour the USC School of Cinematic Arts’ ‘Visions and Voices‘ 40th Anniversary Alien Exhibit. The department’s Director of Programming and Special Projects, Alex Ago, who was kind enough to give us a walk-through of the exhibit and enlighten us on how the project came together. 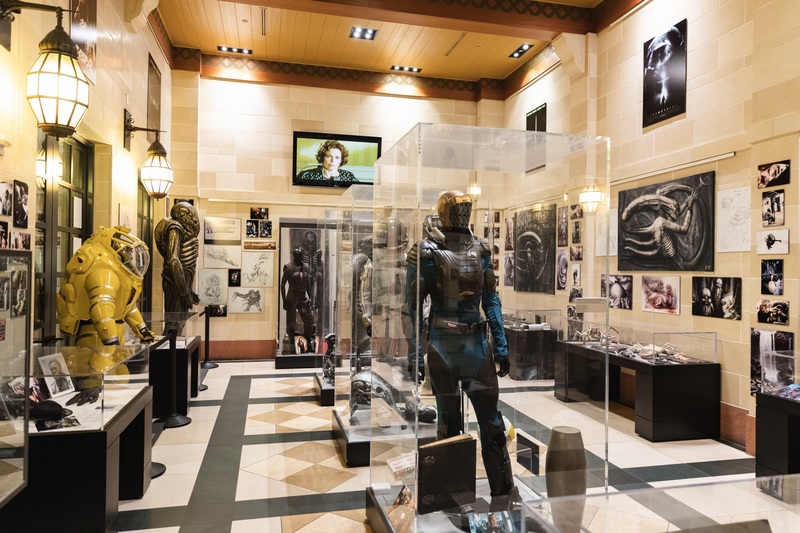 Initially, the exhibit began as an idea to celebrate the anniversary of the original film alone, but expanded to include the wider Alien series. This was largely due to the difficulty in procuring artifacts (at this point) from the first Alien, many of which have been lost to time. Props, creatures, and costumes were more effectively archived in the following sequels, and thus the task of filling a room with these treasures was better suited for all of the franchise. 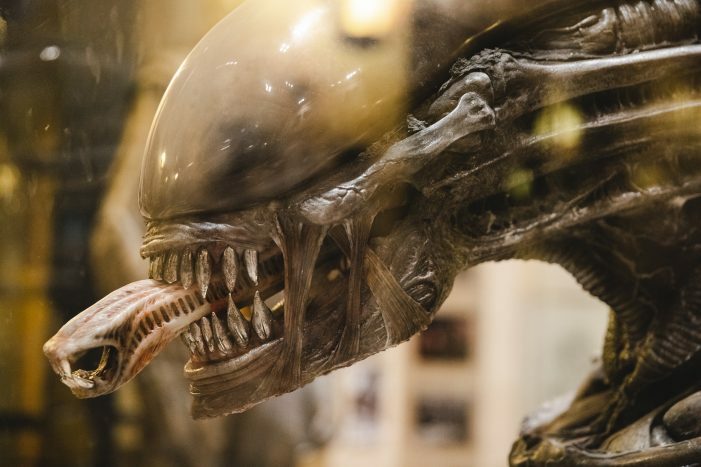 The set used Xenomorph from Alien Covenant (2017) on display in the exhibit. Photo by Adam Zeller. Joining me for the tour was Photographer Mike Monaghan, who some of you may remember as alumni staff member ‘Mikey.’ Mike and I have known each other over the internet for a long time, and it was great to finally meet up in person, especially given the occasion. Mike is currently a professional photographer and I am in the process of finishing my Bachelor of Fine Arts degree in Photography. This commonality essentially made for a collaborative photographic exercise in the exhibit, with subject matter we are both massive fans of. 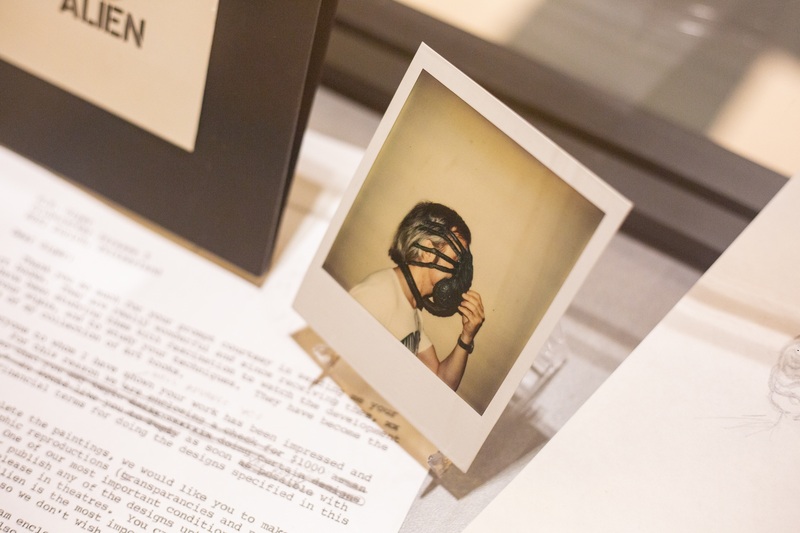 We took a bunch of photos of the exhibit which you can view in the link below. Brace yourselves, there’s quite a few images here! While Mike and I prepared our camera equipment, Alex arrived to meet us, and after some exchanged introductions, we began our tour. Alex Ago, USC School of Cinematic Arts’ Director of Programming and Special Projects, describes to me the documents and artwork on display in the first case upon entry. Photo by Mike Monaghan. At the start of the exhibit, the first thing that greeted us was the Dan O’Bannon display case. This showed off some of the early sketches and documents that were a critical part of the early development of Alien. Donated from Dan’s widow, Diane, some of these papers were instantly recognizable, as I had recently seen the excellent ‘Memory: The Origins of Alien’ documentary at the Sundance Film Festival. The most impressive part of this first case for me was an original Polaroid featuring HR Giger with a facehugger attached to his face. Alex told us this was another item on loan from Diane O’Bannon’s archive for Dan’s work. Original Polaroid of Giger wearing a facehugger on loan from Diane O’Bannon. Photo by Mike Monaghan. I had initially asked Alex to just give us a brief walk-around the exhibit before we had our interview so we could get a sense of what was on display, but he really went all out in describing with great detail everything in the room. Mike and I were quite impressed by just how knowledgeable Alex was regarding all that was shown, I suppose you’d have to be putting something like this together. Alex told us that he took on learning all about the franchise during the planning phase of the exhibit. 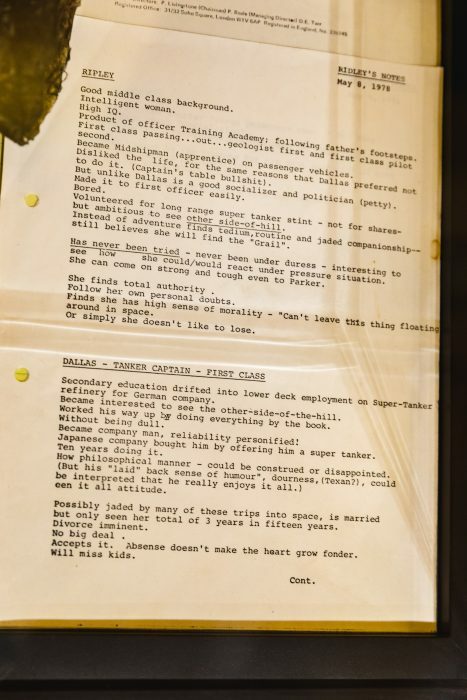 Some early casting notes for Alien, note some of the other famous names being considered. Photo by Adam Zeller. The room itself just had so much on display. Though I was familiar with many of the images of concept art and set photos from the films, seeing a number of props for the first time in person such as the full-sized engineer suit, the Covenant Xenomorph head and torso, or the x-ray prop from Alien‎³ was truly spellbinding as a fan. It’s always a fantastic feeling seeing things in person that were so impactful on screen. Even with the reservations I have about Prometheus and Covenant, I can’t deny the technical craftsmanship that went into these costumes and props. These were just a few of the many props on display, all of which you can observe in the photos we took. A very significant part of the exhibit was the numerous documents on display, many of which were from the development of the original film. Though it was a little disappointing having some of the documents layered over one another, I gained some insight into just how extensive the planning of Alien really was. One of the sheets of Ridley Scott’s notes from 1978 described the histories of the characters of Ripley and Dallas, presenting personal details about their background that I had never been aware of. The detailed character histories of Warrant Officer Ripley and Captain Dallas. Photo by Adam Zeller. It was also great to finally see some of the incredibly impressive and realistic space suits from Alien Covenant in person. I was hoping I’d get a chance to observe them since seeing the photos Xenomophine took during his YouTube Space Alien Day Party a couple years back. The yellow Moebius-inspired spacesuit worn by Danny McBride was particularly awesome. 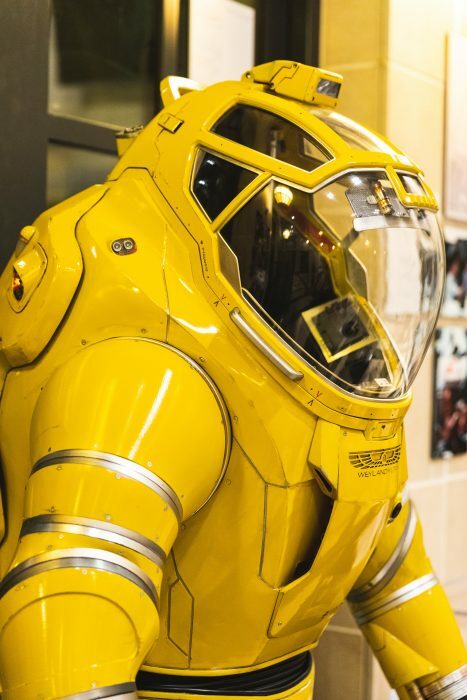 The Eco Systems All World Survival Suit, donned by the character of Tennessee in Alien Covenant. Photo by Adam Zeller. Another notable prop on display that I was unfamiliar with was an early mockup maquette for the xenomorph of Alien‎³. 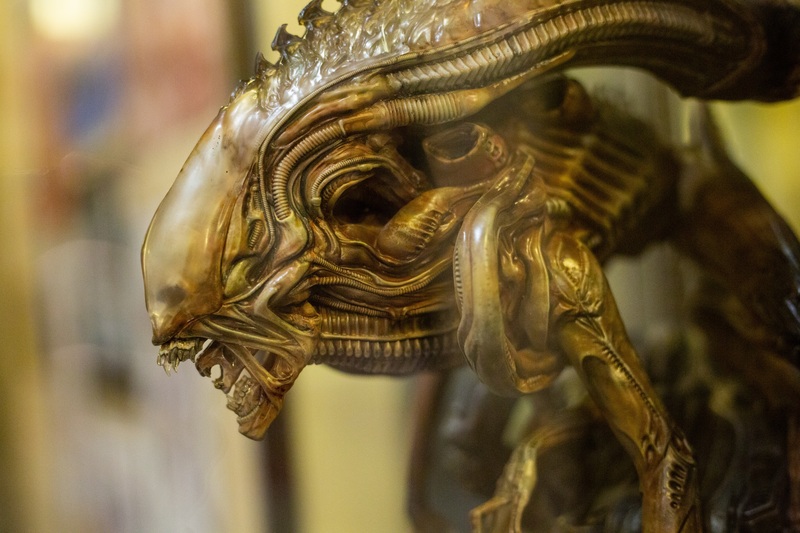 An early Alien‎³ maquette, giving a rough example of the new, more animalistic design. Photo by Adam Zeller. If I did have one nitpick about the exhibit, I don’t feel the second film had quite enough representation in comparison to the rest. Though there was plenty of concept art and set photos on the walls from it, and we did have a few props such as a facehugger in a tank and a smaller missile from the dropship, I would’ve liked to have seen just a few more artifacts from Aliens such as a stunt warrior head, or even just a pulse rifle. Still, there was plenty to observe on the walls that provided further insight. Some of the concept art showed how the original gruesome depressurization sequence in Alien Resurrection featured a human rather than the Newborn, something that StudioADI posted some tests on it some years back. There were also a number of collectibles on display as well. One of the cases was filled with Alien figures released over many years from various toy companies such as NECA, Kotobukiya, Konami, Kenner, ReAction, Etc. 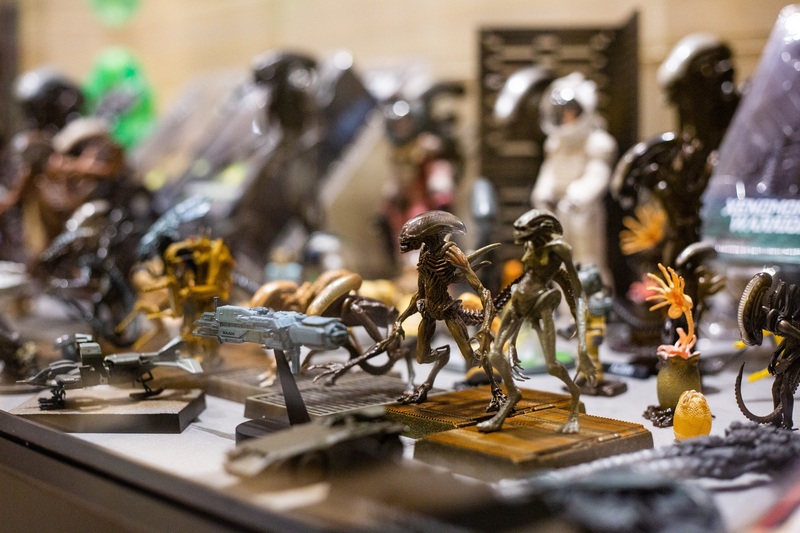 Some of the various Alien figures in the collectibles display case. The Konami figures being in focus. Photo by Mike Monaghan. Another collectible case on display was particularly striking. This one was done in collaboration with Sideshow Collectibles, showing off two of their upcoming massive maquettes: the Alien Queen and the originally designed ‘Mythos’ Warrior Alien. The upcoming Sideshow Collectibles ‘Mythos’ Alien Warrior, created in collaboration with Legacy Effects. Photo by Mike Monaghan. These Sideshow pieces were extremely impressive with meticulous details. It’s also nice to know that Legacy Effects was involved in the creation of these pieces, given their history with the franchise under their former name, Stan Winston Studio. I’ve put together a video of the exhibit, paired with Alex’s descriptions of some of the displays. If you’d like to just listen to the tour, you can do so via the link below. Otherwise, check out our video on the visit. After giving us our tour of the exhibit, Alex answered some questions for us regarding the project’s development and intention. To listen to the full interview audio, click on the image below. The interview is about 38 minutes. This exhibit was brilliant and I’m really glad I got to experience it. It’s running until May 12 and Alex was telling me they have some special screenings planned for sometime before then. If you happen to find yourself in the LA area, I can’t recommend a visit enough. A very special thanks to Alex Ago for the tour and excellent conversation, and to USC’s Visions and Voices initiative for presenting this very special celebration of how far this franchise has come. This has been RidgeTop, signing off. Good job, RidgeTop. Looks like an outstanding display. Would love to see it myself! I wonder at what point during the production this was abandoned in favor of what we ultimately ended up with and more importantly, if there are any design sketches or descriptions of this version of the head. Love the photos! I envy you guys ( both RidgeTop and Mikey), if I was able too. I’d definitely go and see this exhibit.